It was a Saturday morning and Natalie, Molly, the Crew and I had just negotiated the weekend traffic along the M4 and into one of the leafier parts of London. We were in Teddington, a pleasant town in the borough of Richmond upon Thames. Young families were going about their day, buses made their way slowly up the high street and hipster-types stood around looking, well, hip. It was, if I’m being honest, the last place I would have expected to find a lifeboat station. And when my satnav announced confidently that ‘you have reached your destination’, I was far from convinced that we had. In front of me was a very large, very pink block of flats and a rather smart looking restaurant. No seagulls screaming around above our heads. No weather-beaten nautical types repairing fishing nets. Heck, I couldn’t even see any water. But lacking any better ideas, we parked the car and clambered out to get our bearings. And then it all became clear. Stretching out in front of us, down a steep bank, was the mighty River Thames. 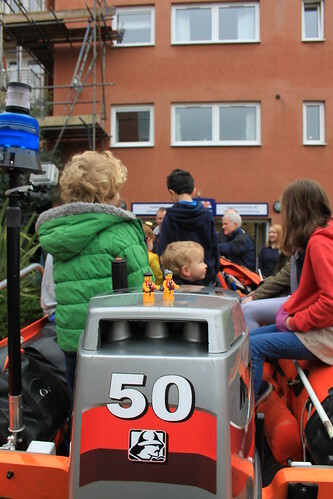 Off to our left, at the base of the big, pink block of flats, was a large, open garage door with a shiny orange D class lifeboat parked in front of it. And above the door were a very familiar flag and logo. 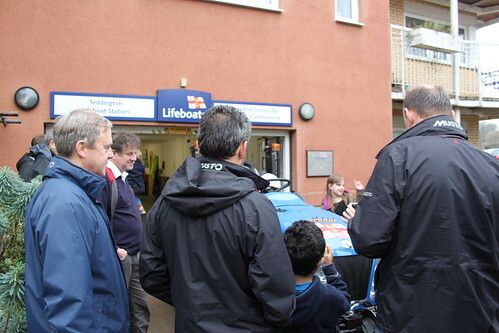 We had, indeed, arrived at the RNLI’s Teddington lifeboat station. I thought at first that there must have been some kind of event happening, as there was a huge crowd of people milling around the lifeboat. Men and women were engaged in deep conversation, while children small and large raced to and fro. I hung back nervously, until Natalie pointed out that I had better get a move on, as they were waiting for me. Well not me, obviously – they were clearly waiting for the Crew. It turns out that there was no need to be nervous, as the Teddington crowd were some of the friendliest and most welcoming people I have ever met. Crew member Claire, who had invited us along to the station, introduced us to everyone she could find and we soon felt right at home. Even Molly, who was given the run of the station. (And made the most of it.) The Crew also wasted no time in making themselves comfortable. It was clear that the Teddington crew were a pretty media savvy bunch. Cameras appeared left, right and centre and the little guys were soon surrounded, paparazzi-style, by keen photographers. Flashbulbs popped and small hands reached out to get closer to the Crew. But the little guys, ever the professionals, kept their cool. Teddington is one of four lifeboat stations on the River Thames. 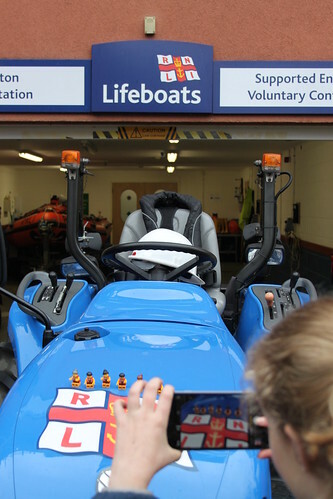 It was established in 2002, making it one of the more recent additions to the RNLI family. It’s also a station with which I feel a bit of a personal connection, as my Dad was involved heavily in setting up the four London stations when he worked for the RNLI. In fact, my little sister remembers driving around Teddington with him years ago, looking at potential sites for the boathouse. The station is also unusual in that it has not one, but two D class lifeboats. It originally had just the one, but it soon became apparent that that another was required if the station was to be able to work effectively across its operational area. Incidentally, when the four London stations were set up, it was thought that they would have to deal with about 50 ‘shouts’ each year. But in the first year alone, they launched over 800 times. And even now the London stations account for around 10% of total launches. Teddington is not the busiest of the London stations, but it is still busy compared with many coastal stations. And just as the station itself is different from many other stations, Claire explained, so are the sorts of things that the boats get called to. Broken down motor boats and drifting dogs (!) feature strongly, but so do people threatening to jump – or actually jumping – from the many bridges over the Thames. The Crew are also sometimes called, sadly, to recover the bodies of those who have been found too late. 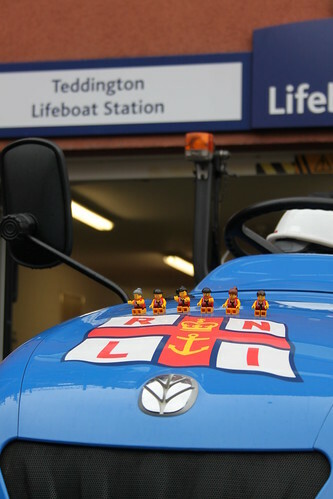 Similar to their coastal counterparts, but unlike the other London stations, the Teddington crew are all volunteers. And, like other crews, they come from a broad range of backgrounds. We met a city commuter and an academic, for example, as well as a B&B owner and a garden designer. Yes, they’re Londoners. And yes, they live quite a way from the sea. But they are still RNLI people through and through. And I, for one, was honoured to meet them. 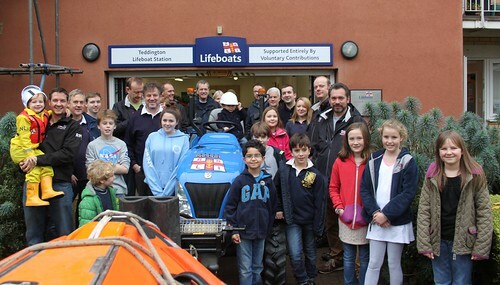 This entry was posted in Out and about and tagged Lifeboats, RNLI, Teddington, The Lifeboat Crew by Simon Perks. Bookmark the permalink.